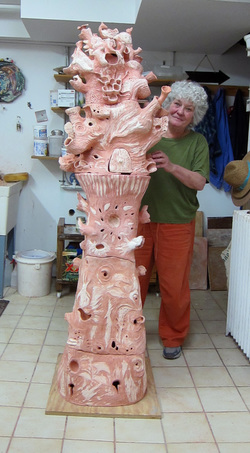 Dina Bursztyn's work encompasses a wide variety of media: sculpture, ceramics, mixed media, public art, works on paper, artist's books, poetr, children's books. She has been awarded several public art commissions, among others, by NYC MTA's Arts & Design Program, NYC Percent for the Arts and the Public Art Fund. Her work has been shown extensively in the US and abroad: including Art in General, Artists Space, Dia Art Foundation,, Neuberger Museum, Center for Book Arts, Instituto de Artes Graficas in Oaxaca, Mexico, Samuel Dorsky Museum, Woodstock Artixts Association and Museum, among others. Bursztyn's work can be found in private and public collections such as at the NYC Central Library Collection of Prints and Artist’s Books and Muller-Schwam in Germany. She has been awarded numerous grants and residencies by Arkane Association , (Morocco) Art Matters, New York Foundation for the Arts, New York Council on the Arts, Lower East Side Printshop, Bronx Museum on the Arts, (NY, USA), Altos de Chavon, (Dominican Republic) and others. ​Artist's Statement : Usually, I start with a concept, but my pieces tend to develop along plans of their own. They are like living organisms captured in a moment within their natural process of transformation. I conceive most of my pieces as contemporary artifacts for a democratic mythology that includes spirituality and sensuality, as well as politics and humor. I am interested in breaking categories and linear hierarchical systems, in marrying cultures, times and ways of thinking.